This is one of 25 documentaries the UFC is making for its 25th anniversary, and it will be available on UFC Fight Pass. On December 8, UFC 231 will take place in Toronto, Canada. The company has come a long way from UFC 1 in 1993, but there were plenty of times between now and then that could have spelled doom for Dana White’s mixed-martial-arts promotion. One of the key moments for the combat company came between November 2000 and March 2001, when they held UFC 28, UFC 30, and UFC 31 at the Trump Taj Mahal in Atlantic City. At the time, UFC wasn’t welcome in many states or venues, but this felt a coming out party of sorts for the brand and for the company. Pretty soon they were hosting events in Las Vegas and major arenas around the nation. So it’s a bit understandable why UFC President Dana White has a soft spot in his heart for the current President of the United States, Donald Trump. White, who has stumped for Trump (including < ahref="https://ftw.usatoday.com/2016/07/dana-white-rnc">at the 2016 Republican National Convention) and been a vocal supporter, is now getting ready to release a documentary about the relationship between Trump and the UFC. The doc is actually one of 25 the UFC has in store for their 25th anniversary this year, much like ESPN’s initial 30 for 30 run during the company’s 30th anniversary. “It’s the 25th anniversary of the UFC and we’re doing 25 documentaries with 25 badass directors for the 25th anniversary and one of them is the story of how President Trump let us come to the Taj (Mahal) for the first fight and he and I went to the residence after that, and he and I both shot for the documentary,” White told UFC Unfiltered in August. 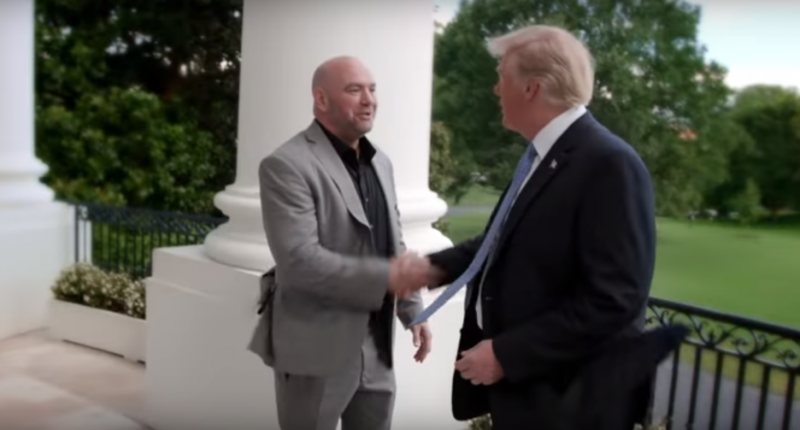 When Donald Trump opened his Atlantic City casino to the struggling UFC, it was the start of an unlikely friendship between the current POTUS and UFC president Dana White. While it’s just a trailer and doesn’t seem to give too much insight into the details, it does appear that the film will be something of a hagiography about not only Trump but also White. All of the documentaries that are part of the series will be available exclusively on UFC Fight Pass.